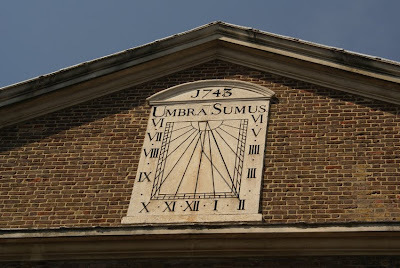 This fine sundial is on the facade of a building in Fournier Street, off Brick Lane. It has been a synagogue, a French church and a Methodist chapel, and is now a mosque. 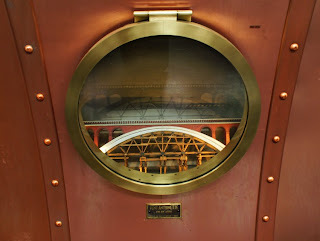 Until the late nineteenth century, the vaults were leased to brewers and wine merchants. The inscription, 'umbra sumus', translates as 'we are shadow'. The HEIGHT of 167 FEET! with his Face striking the water first, and will go through many Feats of Agility aloft, and in the water, he will LEAP with TWO CATS, one on each side of the body, upon the above-mentioned days. - S. S. having gone through the same Performances at Liverpool, Brighton, and many other parts in Great Britain, feels confident, from the patronage he has been honoured with by the Nobility, Gentry, and Inhabitants who witnessed him, that the will be found deserving of the kind support of the Public, upon these occasions. Scott called himself an American and had apparently already leaped from Niagara Falls. However, it was widely thought that he had in fact been born in Deptford. On his arrival there could not have been less than from 8,000 to 10,000 persons assembled upon the bridge and along the banks of the river to witness his extraordinary performance. Immediately over the second arch on the Middlesex side and nearest to Somerset-house, was erected a species of scaffolding, composed for two upright poles, and three others crossing them at intervals of about four or five feet, the entire height of which above the balustrades being about 10 feet. Scott appeared as usual, firm and undaunted, and made several jocular remarks to those around him. Having ascended the scaffolding, he attached the rope he carried with him, which was about 10 feet long, to the uppermost cross pole and after placing some tin boxes round the necks of several of his friends who were to collect money for him, proceeded to commence his performance, observing, "Why you all appear to be cranky." He first put his head into a noose of the rope, and suspended himself for a minute or two; after which he placed his feet in a similar position, and swung with his head downwards. He again mounted the top beam of the scaffold, and, taking a handkerchief off his head, placed it on the top of one of the perpendicular poles. He then seized the rope, and placing it round his neck, exclaimed at the top of his voice, "Now I'll show you once more how to dance upon air before I dive." The unfortunate man again let himself down to the extremity of the rope with his head in the noose, but had scarcely hung more than three or four minutes when a person named Brown observed that he much feared the man had hung himself in reality, as animation appeared suspended. To this one of Scott's friends replied, "Oh, he has not hung half his time yet." In two or three minutes after, however, shouts were heard in all directions of "Cut him down." Mr. Brown immediately ascended and raised the poor fellow's arm, which on being let go fell heavily back to its original position by his side. This gave convincing proof of the suspension of animation, and renewed cries were raised from all quarters of "Cut him down, cut him down." Some time elapsed before a knife could be procured, and then two persons ascended the ladder, and with the aid of some of the F division of police, succeeded in cutting the man down. Mr. Havers, surgeon of the York-road, and another medical gentleman who happened to be upon the spot, immediately stepped forward and opened the jugular vein, and also a vein in the arm, but only a few drops of blood followed; and to all appearances Scott was lifeless. A cart was then procured, in which he was conveyed with all possible speed, followed by hundreds of persons, to Charing-cross Hospital. On his admission, it was ascertained by Dr. Golding, the senior physician of the institution, that life was not quite extinct. Under that gentleman's direction, the unfortunate man was, in the first place, subject to the galvanic process; secondly, cupped between the shoulders; and then, lastly, placed into a warm bath, in which he had been but a few seconds when it was ascertained that the vital spark had fled. After Scott's death, his widow settled in Deptford. Various Deptford people found ways to accumulate fortunes in the eighteenth century. Shipbuilders, merchants and manufacturers might all amass large sums of money - but John Greenleaf's route to riches was rather more unusual. A few days ago [in 1788] died at Deptford, John Greenleaf, commonly called Lord Greenleaf, a Fidler, who by playing of country dances at hoops, fairs, &c. had amassed a fortune of 3000 l. Upwards of 600 people attended his funeral. Few sons of Orpheus in higher life die so rich. 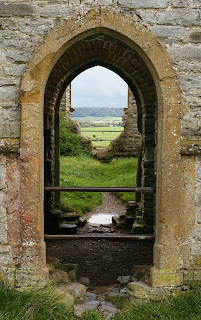 Like a cousin to Glastonbury Tor, Burrow Mump rises unexpectedly from more level countryside and is topped by a church. Both words, 'burrow' and 'mump', mean hill - which perhaps emphasises just how striking its appearance is. 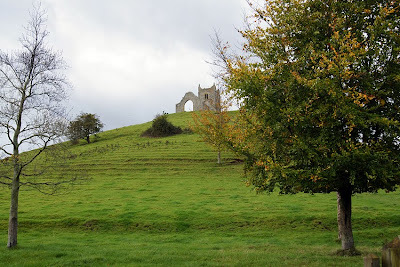 Despite appearances, the hill is a natural one; it has probably been used as a place of worship for the past millennium. 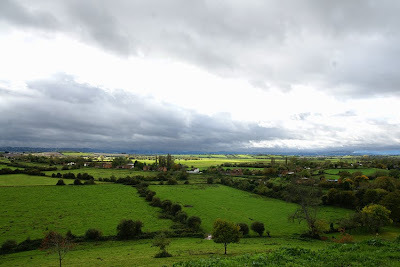 There have also been attempts to associated it with King Alfred, who did spend time at nearby Athelney, but evidence is lacking. The current, ruined church is mediaeval and dedicated to Saint Michael. 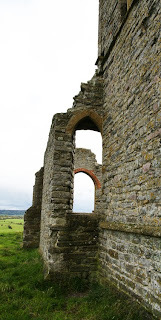 However, the Mump also played a more martial role in the seventeenth century when Royalist soldiers took refuge im it during the Monmouth Rebellion. One of them is buried in the crypt. 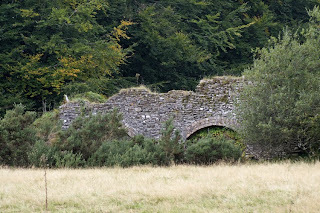 A new church was built in the village below at the end of the eighteenth century, and the building has now fallen into ruin. Nonetheless, it gained a new function when the owner Alexander Gould Barrett gave it to the National Trust as a memorial to the people of Somerset who died in the First and Second World Wars. The walk to the top is a popular one - and deservedly so, as the views are amazing. We walked up after rain showers, so the colours were at their brightest and most vivid (and the hill at its most slippery - sturdy footwear is recommended!). Patronising, sexist and sometimes disturbing: American advice to men on how to 'break in' women workers during World War II. After all, 'a foreman will always have the eternal feminine to contend with'. Postman's Park (50): another new plaque? Following the addition of a plaque commemorating Leigh Pitt to the Watts Memorial, another name has been put forward. The Rev Stephen Arkwright went on holiday to Southwold in 1965. While there, he saw a girl in difficulties in the sea and swam out to rescue her. Tragically, although she and another would-be rescuer were taken back to shore in by a passing dinghy, Rev Arkwright drowned. Before his death, he had been working as an assistant librarian at Sion College. When Paula Flynn came across his story there, she launched a campaign to have his bravery commemorated in Postman's Park. She is also trying to find out more about the rescue. It seems that the memorial has gained new momentum. More of its empty spaces may now be filled by stories of 'everyday heroism'. Tomorrow (Thursday 22 October) at 6.30pm, Trafalgar Square is hosting an evening of films about London's transport. Selected from the BFI archives, they cover more than a century and range from Victorian lady cyclists to Piccadilly Circus underground station in 1931 - before coming right up to date with Project One, showing a skateboarder's journey alongside the Thames from the Barrier to South Bank. Pianist Neil Brand will be providing a sound track. The running time is 90 minutes, so warm clothes and comfy shoes would be a good idea! If the evening is as good as last year's event, it will be worth braving the autumn chill for. Meanwhile, today's Times suggests that a scene in Underground, a 1928 feature film to be shown on Friday, explains why we stand to the right on escalators. Rather than being an arbitrary decision, it's because early escalators ended on a diagonal so the left foot was still on the moving section as the right foot stepped off. Standing to the right allowed walking passengers to continue on the moving section as they overtook. 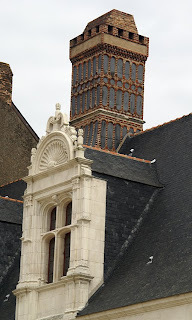 Another fine example in my chimney collection: this one features on the recently-restored Chateau des Ducs de Bretagne in Nantes. While much of the fortified chateau dates from the late middle ages, the chimney tops a more recent section. Nantes is now part of Loire-Atlantique, but that's an administrative designation: it was historically the capital of Brittany. Thus visitors to this city will find that although it's no longer officially Breton, the language and culture are still evident. In 1532, Francois I pronounced here the edict by which Brittany ceased to be independent from France. He built himself a new residence within the chateau walls, topped with elaborate brick and slate chimneys. That it feels more French than Breton in style is an apt reflection of the history made just below. Distrust of public transport appears to be a recurring London theme. A few days ago I mentioned the public's difficulties with watermen, so I was fascinated to see that a century later, concern about over-charging cab drivers led to a 'zoning' proposal. In 1865 one John Leighton, Fellow of the Society of Antiquaries, suggested that London's boroughs be reshaped into hexagons; each hexagon could be allocated to one of four charging zones. In the centre was the City; around it were three circles with Deptford in the second. The letter and number identifying each 'cell' of the honeycomb would be displayed at every street corner. Unsurprisingly, the proposal wasn't taken up. The Thames is notable by its absence from the map, for one thing. However, it's a fascinating idea - see the map and more of the story on Strange Maps. Kosmograd play with the idea; look carefully at their hexagonal division of contemporary London and you can see the problem posed by the Thames. As for Leighton, his interest in London's transport didn't end with its cabs. His last published work was a 1902 pamphlet entitled Tubular Transit for London, suggesting improvements to the Underground. That was only one of a wide range of interests, though: Leighton was involved in politics as a liberal unionist; he briefly owned the Gentleman's Magazine and was a founder of the Graphic. He also encouraged the collection of bookplates, and was a founding member and Vice President of the Ex Libris Society, as well as a founder of the Photographic Society. He lectured on Japanese art at the Royal Institution and was on the Commission of the 1851 Great Exhibition. His main career, though, was as a bookbinder, author and illustrator. Born in 1822 into a bookbinding family, he studied as an artist and wrote and illustrated a number of books - many under the pseudonym Luke Limner. Although that work continued throughout his life, from the 1850s he also produced designs for bookbindings. A gallery of his work shows playful, imaginative designs - quite a contrast to the formal hexagons of that borough map. John Leighton died on his ninetieth birthday, in 1912. 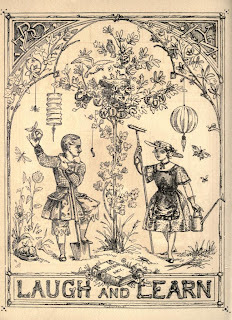 Image from John Leighton, The Royal Picture Alphabet. 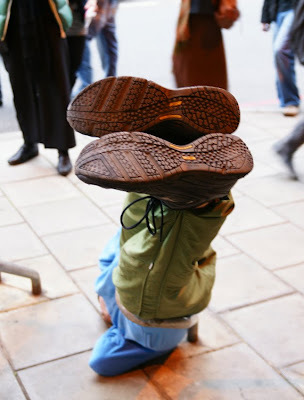 Over the weekend, the area around London Bridge has seen performances of Willi Dorner's work bodies in urban spaces. It involves twenty dancers forming 'human sculptures' along a walking route, for spectators to spot. I was one of a large number of people who followed yesterday afternoon's performance. The event was in some ways a victim of its own success: since the dancers have to create each 'sculpture' for a limited time before moving on to the next site (and some of the poses are incredibly difficult to maintain), pressure of numbers meant most people saw only some and arrived at others just as they were ending. The element of discovery was also limited by the presence of a surrounding crowd! 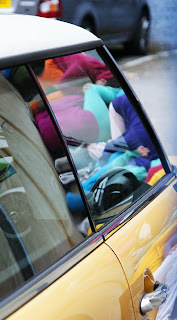 The event, part of Dance Umbrella, was interesting and gathered some intrigued passers-by as it went along. However, the logistics of negotiating through a large crowd on traffic-filled roads were distracting. Some of the poses reminded me of works on the Paris street art walk, and I couldn't help missing the opportunity that had offered to pause and give each piece the attention it deserved. Now that the signs of autumn are definitely here, a little bit of seasonal-looking vegetation from Lilstock. Although it's associated with urban spaces, street art can be found a long way from the city. 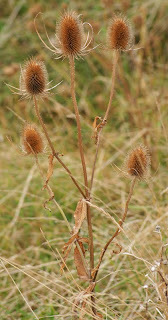 I came across this image by the beach in the hamlet of Lilstock. This stretch of shore has a nearly-secret history. A grassy dip and a bit of breakwater are almost all that remain of a once-thriving harbour. It was established by Sir John Acland to ship coal from South Wales, fuelling the limekiln on the cliff above. Pit props were exported in the opposite direction, and by 1855 the port was successful enough to have its own customs officer. There were also cottages, fishing boats, and even daytrippers stopping off on their steamer excursions from Cardiff to Ilfracombe. However, after the First World War the harbour had fallen into disuse. Keeping it clear of the pebbles which make up the beach had always been a major job, and the inlet quickly became blocked up. Today, there are few traces of a once-thriving Somerset port and most people are unaware it ever existed. Like nearby Brendon Hill, it has largely reverted to nature and agriculture. Westminster Bridge offers famously impressive views of London: Wordsworth was moved to write that 'Earth has not anything to show more fair'. In particular, the presence of the Houses of Parliament at one end virtually guarantees the presence of tourists photographing each other there. 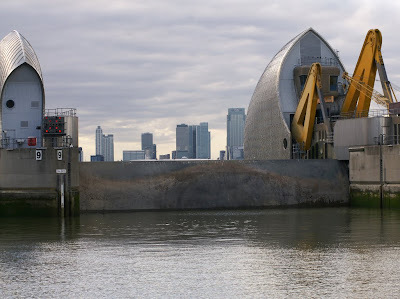 It's not all about scenic sights, though: its history offers a nice illustration of the vested interests affected by the building of new London bridges. 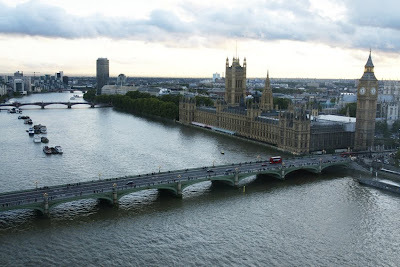 When a bridge was proposed for Westminster, the Corporation of the City of London were furious. Until the eighteenth century, they had London's only bridge. As they charged a toll to those who crossed it, new bridges threatened their income. For an indication of how profitable that was, those tolls funded a property portfolio from which the City Bridge Trust would go on to build two further bridges, buy Southwark Bridge from its private owners, and provide much of the funding for the Millennium Bridge. Today it maintains the five City bridges, makes charitable grants and has an annual income of nearly £35 million. On Saturday Evening an Oyster Woman went on board a Ship off Deptford, and on her Return to shore, the Waterman, who carried her, demanded Threepence as his Fare, which she refused; and Words arising, she immediately stabbed him in the Belly with Oyster Knife, for which she is sent to Maidstone Gaol. Whatever the opposition groups thought, there was certainly a popular appetite for the bridge. It was paid for by lotteries and private capital, and built in 1750; this was the only crossing between London Bridge and Putney, so it proved pretty popular. Indeed, the City was moved to respond by widening their bridge and clearing it of the buildings which had crowded either side. They also built their own new bridge, Blackfriars, which opened in 1769. Westminster Bridge was so well-used that by the mid-nineteenth century, it was subsiding: the current bridge replaced the original in 1862. It gained a new feature at its southern end for the millennium, the London Eye, from which I took today's photograph. Kingsway Tram Subway opened in 1906, taking single-decker trams under the road from Southampton Row to Aldwych. It was part of the route from Highbury to either Tower Bridge or Kennington Gate; there's a south-east London connection as some of the cars were stabled at New Cross tram depot, now New Cross bus depot. In 1931, the subway reopened after works to make it suitable for double-decker trams. However, its days were numbered: after the war, it was decided that buses should replace trams, and in 1952 the tram services closed - and with them, the subway. 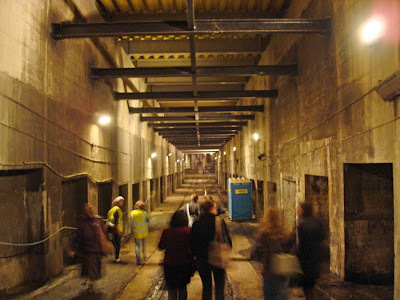 Although tests of its suitability for motor vehicles were carried out, only part of the tunnel was ever opened to traffic as the Strand Underpass. The rest of it has mainly been used for various kinds of storage - and as a film location beginning with Bhowani Junction in 1955. 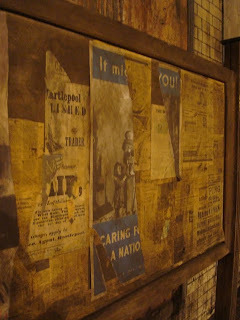 Props including station signs remain from more recent productions including The Escapist. The subway is rarely open to visitors. The venue, then, is as interesting as the artwork for many of the visitors to Chord. Unfortunately I'll have to miss this one, but on Monday 19 October the Thames Discovery Programme are holding a Black History Month event in Deptford. S I Martin, author of Britain's Slave Trade, will be leading a walk highlighting the Black heritage of Deptford and the Thames. The walk begins at 2pm outside St Nicholas' Church; for more information and booking details, click here. Chord is a huge art installation by Conrad Shawcross: two extraordinary machines with flower-like arrangements of spools. 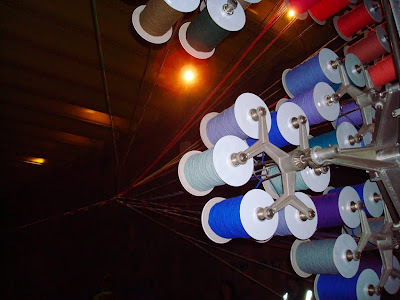 They move from the centre of their track towards the ends, weaving rope as they go. 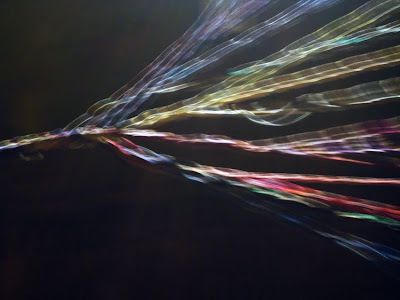 The dark tunnel, the gentle movement and subdued sound and colour make this a strangely hypnotic experience. 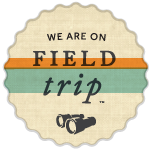 This event runs until 8 November, with hourly tours which must be pre-booked here. For more about the Kingsway Tram Subway, click here. 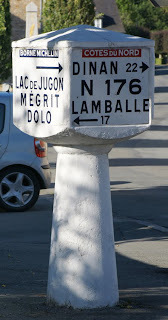 France took rather longer than Britain to standardise its road signs. Before the state took over, Michelin did a great deal to help the motorist - and to advertise its products. Michelin began providing signs in 1910. Although it gave them freely to local authorities, the company was careful to include its own name. Among other organisations providing signs were the Touring-Club de France and Michelin's competitor, Dunlop. 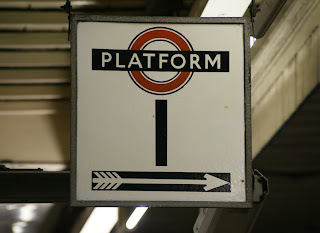 However, in 1946, government regulations finally brought standardisation and sponsored signage came to an end. Nonetheless, some examples remain, such as this one in the picturesque Breton town of Jugon Les Lacs. Painted wall advertisements didn't cease to be created in the 1960s, but they did change. Today, they tend to be painted onto the actual business premises and are generally less ambitious, a topic I might return to in a later post. However, on a recent visit to Paris I was pleased to see this splendid creation on the boulevard Montmartre, dated April 2009. I was passing on a bus at the time so couldn't check that it's actually painted; close examination of the photo (left) suggests so. What is certain is that the style and placement of those earlier adverts has been colourfully recreated, to great effect. 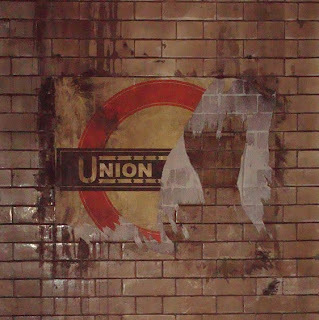 Articles mourning the disappearance of a Savon Cadum ghost sign from this very wall indicate that it has been recreated by popular demand rather than as part of a wider campaign by the brand. 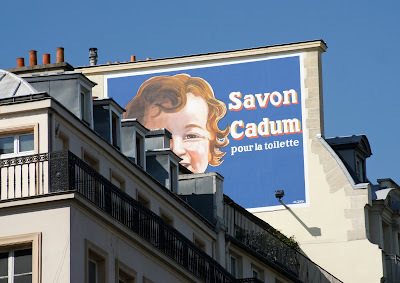 As for Cadum soap, it first used the baby in its advertising in 1912. The infant soon appeared on the walls of Paris, as well as in pharmacies and on posters and newspaper adverts. A year later, the rumour began that the model for the Cadum baby had died, prompting the company to put inserts into newspapers urging readers to look at the millions of lively Cadum babies all around them. The baby entered popular culture; surrealist Alfred Courmes painted a madonna and child with the Cadum baby in the role of Jesus. After the Second World War, the baby disappeared from Cadum's adverts and then from its packaging. 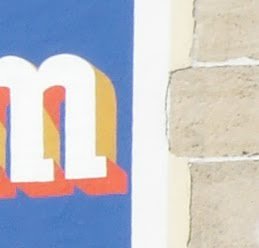 However, since the 1980s it has made reappearances in retro adverts and soap wrappers, while the phrase bébé Cadum has kept its place in French vocabulary. 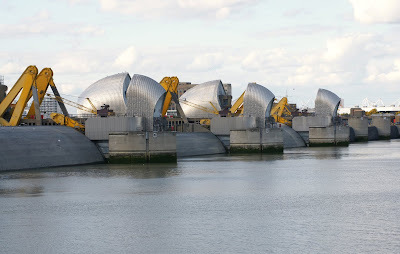 This photo of the Thames Barrier, taken yesterday, is a bit different from my earlier efforts - the barrier is closed. No, London wasn't at imminent risk of flooding! Instead, the barriers were raised all day for annual maintenance and checks. The Environment Agency had made a real day of it, with stalls and lots of information available as well as free entry to the visitor centre. Most interesting, of course, was the sight of those gates - looking much less shiny than the rest of the barrier, as you'd expect when they spend most of their time underwater. Opening and closing the barrier requires care to ensure that too much change to the river too quickly doesn't cause problems. 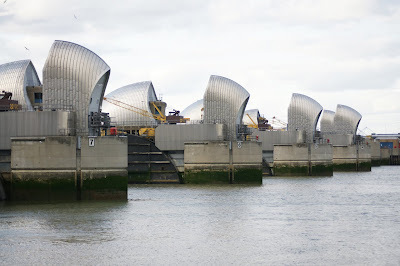 The barrier was therefore partially lifted in the early afternoon to allow some water to flow underneath, but only reopened when the water to the east of the barrier, still rising and falling with the tide, was at the same level as the water to the west. At about half past four, the levels matched and the gates were opened two at a time. In the picture above, the gates are almost back underwater. The birds taking a ride on the right-hand gate will have to move very soon! 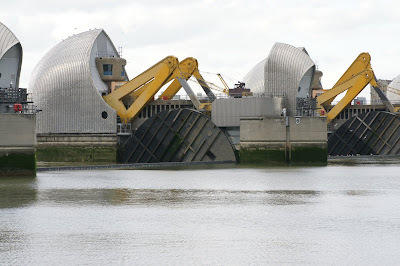 However, there's still a way to travel out of sight before reaching their open position with the lines on the 'wheels' back to the horizontal and the gates themselves on the riverbed, safely out of the way of river traffic (below). 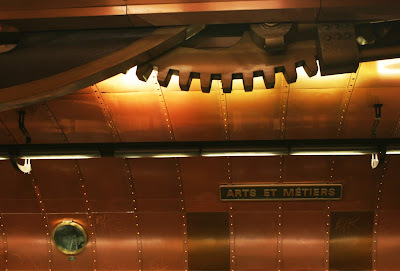 One of my favourite stations on the Paris metro is Arts et Metiers. 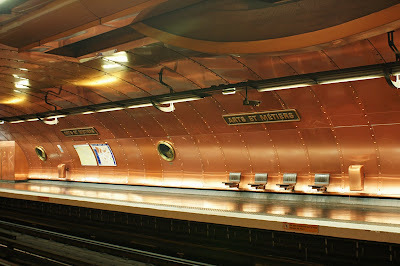 In contrast to the more usual tiled interiors, this station is lined with copper, giving it the feel of a steampunk submarine. Rivets, portholes and giant wheels and gears enhance the effect; even details like the litter bins are carefully co-ordinated. The portholes contain carefully-crafted little scenes. Beware, though: it's easy to be so caught up in these details that you forget to take your train! It's not so surprising, then, that its Belgian designer François Schuiten is best known for his graphic novels in which Jules Verne frequently appears. 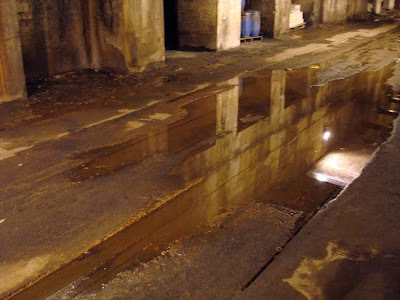 The renovation was carried out in 1994, with the city transport authority working in partnership with the Musée des arts et métiers (Museum of Arts and Trades). Charles Burney, DD, FRS, rector of this parish and of Cliffe in this county. Prebendary of Lincoln, and Chaplain in Ordinary to His Majesty. Born 4 Dec 1767 and died 28 Dec 1817. In him were united the highest attainments in learning, with manners at once dignified and attractive, peculiar promptitude and accuracy of judgement, with equal generosity and kindness of heart. His zealous attachment to the Church of England was tempered by moderation, and his impressive discourses from the pulpit became doubly beneficial from the influence of his own example. 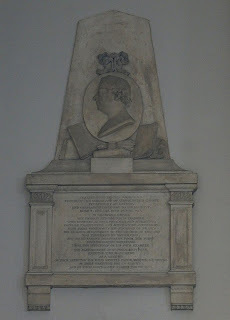 The parishioners of St Paul's, Deptford, erected this monument, as a record of their affection for their revered pastor, monitor, and friend, of their gratitude for his services, and of their unspeakable regret for his loss. Charles Burney went on to study in Aberdeen - successfully this time - and became a schoolmaster. He was already looking for a church career, but the book episode made that difficult. As a well-regarded classical scholar and educationalist, though, he began to recover his reputation. He was finally ordained, and granted a Cambridge degree, in 1808. Burney's career in classical scholarship continued; he became a Fellow of the Royal Society; and he was also promoted within the church, as his monument records. By 1810 he was the King's Chaplain and he became rector of St Paul's the following year. 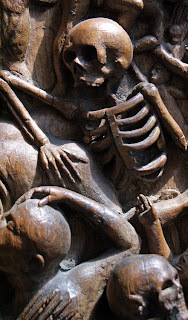 However, aged only sixty he died of an apoplectic stroke and was buried in the churchyard of St Paul's. As well as his memorial there, he also has a bust in Westminster Abbey. His most lasting legacy, though, may be his collection of (honestly acquired) books. These were bought by the British Museum for the huge sum of £13,500 after his death, and as the Burney Collection formed an important part of the British Library collections. 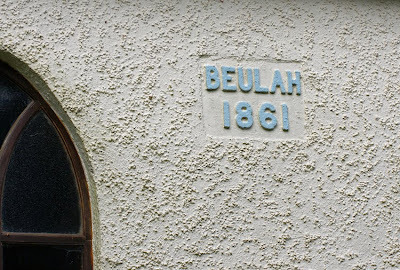 This date on a chapel is more poignant than it might first appear, recording as it does the heyday of a village which has since all but vanished. 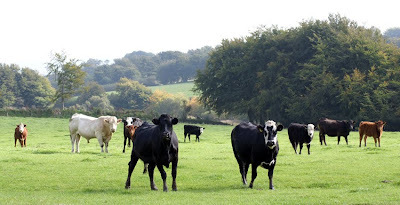 Today, Brendon Hill in Somerset is a quiet agricultural spot, complete with fields of cows and sheep. Indeed, the cows seemed curious and not a little surprised at being disturbed by visitors! There's also a house, the chapel, and not much else. However, in the mid-nineteenth century this was a thriving industrial village. Following the Enclosure Acts, a number of small iron ore mines had set up in the area, and in 1853 one Thomas Brown formed the Brendon Hills Iron Ore Co which brought several mines together. West Somerset Mineral Railway soon followed, taking the ore to Watchet harbour where it was shipped on to Ebbw Vale Ironworks, and the village grew to about 250 people. They had a general store, a church and two chapels, as well as establishments selling coal and building materials. In the early 1880s, though, Spanish iron ore fell drastically in price. Unable to compete, the Somerset company virtually ceased production. Although it would briefly revive around 1908, the company's time was past and the village died with it. The ruins of some structures remain, virtually unnoticed by passing cars and threatening to disappear into the greenery which now thrives in the mines' place. While most of the village buildings are gone, the railway may undergo a final revival: there is a project currently underway to preserve remaining structures, raise awareness of the railway's history, and improve access to the sites. Not least of these is a winding house which helped bring engines up a 1:4 incline:,some indication of the engineering significance of the railway. This brief but important episode in Somerset's industrial past is getting the attention it deserves.